This is THE hot spot in Oak Bluffs, filled with colorful shops and boutiques, restaurants, cafés and nightlife. Want the best cup of coffee? Or an ice cream shop you’ll remember all year long? How about delectable seafood dishes? When you want to be at the center of all the action, Circuit Avenue is the place to be! Tour the iconic Gingerbread houses. At the Oak Bluffs Campground, you’ll find the famous gingerbread houses, built in the late 1800s. The campground began as a retreat for Methodists who came to the island to worship. As time went by, they built these quaint cottages—instead of tents—in bold, pastel colors. Today, the Victorian cottages are carefully preserved. Come and visit, take pictures, and check out some of the many activities going on at the Campground—everything from movie nights to live concerts at sunset. Enjoy the best clam chowder! Martha’s Vineyard Chowder Company has been voted the best clam chowder on the island by Yankee Magazine, Cape Cod Magazine and more. When the weather gets cooler, it’s a perfect time to settle in with a steamy bowl of their signature soup. But the locals will tell you, there’s even more to love here—from lobster rolls, sweet chili wings and steaks to gourmet salads and chicken dishes. You MUST try their risotto balls and grilled asparagus dishes, too. Take a ride on the Flying Horses Carousel. Carved in 1876, this is the oldest carousel in the world and a must-see when you visit Martha’s Vineyard. It’s been a treasured landmark in Oak Bluffs for centuries—also declared a National Historic Landmark. Go for a ride on this, and make another great family vacation memory. Enjoy a sweet treat at Mocha Mott’s. This is a favorite destination among both visitors and locals. Sample their coffee, espresso drinks, baked goods and more. It’s a perfect place to hang out and enjoy people watching, or take your food and drinks to go! Visit Island Alpaca in Oak Bluffs and get up-close and personal with these furry friends! The kids will love petting them, and there’s also a gift shop. Admission is $5 per person during the season. Off season, donations are appreciated. Catch some sun and fun at Oak Bluffs beaches! Oak Bluffs Town Beach offers calm, shallow water that’s ideal for the whole family. This beautiful beach begins near the Steamship Authority dock and ends at the first jetty toward Edgartown. Oak Bluffs Town Beach is open to everyone. Joseph Sylvia State Beach, also located in Oak Bluffs, gives you two miles of clear, mild water and incredible views. Bring your camera and head to Beach Road between Oak Bluffs and Edgartown. It’s another great place to spend an afternoon and make wonderful vacation memories. 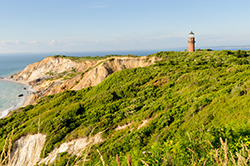 At A-A Island Auto Rental, we’re the gateway to all the fun on Martha’s Vineyard! Contact us today!